As we all know, acrylic paint dries very quickly and there are times when we would prefer the paint to remain workable for longer periods of time. You could always switch to oil paints, but for those of us who love acrylic paints, this is not an option. Acrylic paint starts to dry and form that annoying “skin” in roughly 10 to 20 minutes. This can be rather frustrating but luckily there are mediums and additives that we can add to acrylic paints to slow down their drying time and make for a much more enjoyable painting experience. Watch the video below to learn more about these mediums and additives by Liquitex that you can conveniently purchase online from Blick Art Materials by following the links below. 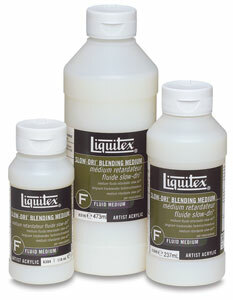 This clear-drying Blending Fluid is uniquely formulated for superior surface blending with acrylics. Add up to 50% of this medium without jeopardizing the strength of the paint. It increases the “open” working time up to 40%. Great for forming softer edges and modeled forms. It dries clear, and is flexible, non-yellowing, and water-resistant when dry. This clear-drying gel has characteristics similar to Slow-Dri Blending Fluid. Use it where retention of brushstrokes and impasto effects are desired. It increases the “open” working time up to 40%. It dries clear, and is flexible, non-yellowing, and water-resistant when dry. 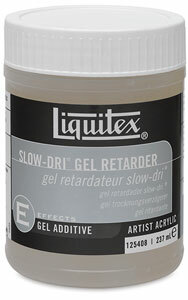 Use this additive with Liquitex Acrylics to extend drying time. It increases transparency when floating, shading, blending, and washing colors. Use Slow-Dri Fluid Retarder in place of water before loading the brush with paint, to eliminate drag and improve flow. It helps to reduce paint skinning on the palette, and is excellent for liner work, transparent washes, and wet-on-wet techniques. Cleans up with soap and water. Use this additive with Liquitex Heavy Body Artist Color, Liquitex Heavy Body Mediums, and all other acrylic paints and mediums when working in low humidity, or whenever increased workability and blending time are desired. Similar to Slow-Dri Fluid Retarder (except in a heavy-body , thick consistency), Slow-Dri Gel Retarder also retains brushstrokes and adds body when added to to lower-viscosity colors such as Liquitex Soft Body Artist Color and Soft Body Mediums. Add no more than 25% to paint, as the absence of a binder may weaken the stability of the paint film if too much is added. It is the best time to make a few plans for the longer term and it’s time to be happy. I’ve learn this publish and if I may just I want to suggest you few fascinating things or advice. Maybe you could write subsequent articles relating to this article. I wish to learn even more things approximately it!